Female fronted doom metal is certainly in vogue these days, with an ever expanding list of bands joining the fray. Now you can add Swedish act Besvärjelsen to the roster with their doomy debut, Vallmo. Taking pages from both the dark, mysterious works of Messa and the 70s rock oriented Avatarium, Besvärjelsen stirs in psychedelic and folk elements and takes the unusual approach of employing 2 bassists. This makes for a rather volatile mixture of ingredients and the band does their best to keep this roiling musical stew from boiling over into a hot mess. In this endeavor they’re fairly successful and Vallmo reeks of potential and possibility, even as the band sometimes under-cooks and over-seasons their goods. 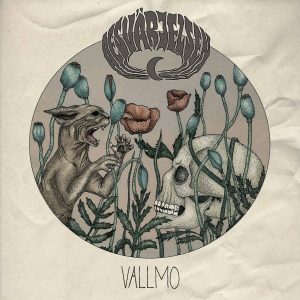 Vallmo opens with a confounding cut in “Mara.” It sports something like a country-western riff line before bleeding into a traditional doom approach featuring heavy riffs as Lea Amling Alazam provides sultry, edgy vocals, sounding like cross between Jex Thoth and Castle‘s Elizabeth Blackwell. The song has interesting moments, moods and ideas and Lea is quite a charismatic singer. The problem is that things feel very disjointed and muddy throughout. I hesitate to call it rough and unpolished, but it is, and not in a good “metal” kind of way. Luckily the band gets their feet under them and followups like “Return to No Return” are much better, using a traditional doom template with solid results, sounding a bit like an extra bleak Reverend Bizarre. Lea sounds enchanting while keeping enough danger and menace in her voice to compliment the heft of the music. They weave folk influences through “Röda rummet” that works nicely, as does singing in their native language, but things still feel a bit awkward and unrefined at times here too. “Öken” is one of the high-points, taking a straight ahead approach like vintage Cathedral, battering the listener with huge riffs and driving tempos. The vocals trade-off between Lea and one of the male guitarists for a nice change of pace, and the band seems to be finding their stride. There are some sweet guitar harmonies along the way and you can hear the talent the band possesses quite clearly, even though the song itself won’t entirely blow you away. Another showcase of the band’s potential is “I skuggen av ditt mörker.” Its droning, melancholy Messa vibe is effective and mysterious, weaving dark, arcane energy, and there’s some impressive guitar-work rounding out the song’s back-end. Yet still it feels like something is missing from the final product, though I can’t say what. 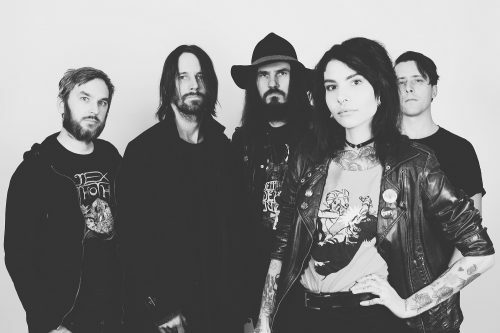 The nearly 11-minute closer “Alone” is their best moment as they manage to make that ponderous runtime feel manageable, letting Lea charm with her vocals, backed by simple doom riffs and more trippy, funky little jams. More than any other track, this one suggests a band just on the cusp of figuring things out and becoming a serious entry in the doom sweepstakes. At 52 minutes, Vallmo doesn’t feel too long. The production is a bit of an issue however, sounding quite muddy and soupy at times, as on “Mara.” There isn’t much separation between the instruments either, with 2 guitarist and 2 bassists battling for space. Lea’s vocals sound buried on some tracks, but too upfront on others, never quite settling into a comfort zone. The double bass presence creates a bottom-heavy sound, but this doesn’t always work in the band’s favor. It just sounds murky and mushy. Speaking of the 2 bassists, the band doesn’t do as much with them as you’d expect. They deliver a deep rumbling sound similar to Neurosis, but you can’t really discern much of what they’re doing at any given moment. Guitarist Andreas Baier and Staffan Winroth fare better, especially when it comes to their free-form soloing and jamming. This is when Besvärjelsen is in high feather and where things always seem to come together. By contrast, their lead riffs are decent, but never stunning or particularly memorable. Lea is the glue that holds the whole enchilada together, and I like her voice. It’s a bit rough and unrefined, but it suits the material. Vallmo has its own intriguing vibe, energy and a few impressive moments, but there are issues holding the album back from really resonating. Potential is the word that keeps playing through my mind as I spin it. It’s there, it’s obvious, but it isn’t fully realized here. Not a bad little doom album by any stretch, and Besvärjelsen is definitely a band to watch going forward. I predict good things in their future and it will be interested to see what they can do with some experience under their belts.